It’s a new month, which means new Bible Journaling Kits! If you are a Bible Journaler like me, you know what I mean. I love when I get a new devotional in the mail with some beautiful pieces to spark my creativity. One of the Bible Journaling kits I am working through for the month of October is Illustrated Faith’s Grace And Gratitude. DaySpring did send me this kit in exchange for an honest review. Affiliate links are used in this post. If you have followed DaySpring or Illustrated Faith for awhile, you may be familiar with their November tradition of “Gratitude Documented.” Each day of November, they give a prompt you can use to journal in your Bible or notebook. We all do it as a community, which is not only fun, but so encouraging! I love looking up the hashtag and seeing what everyone is grateful for! This year, Illustrated Faith has decided to combine Gratitude Documented and their Bible Journaling kits! So, the Bible Journaling kits for the months of October, November, and December will all have a similar look and feel to each other. The Bible Journaling kits have been designed with inspiration from the 100 Days Of Grace And Gratitude Devotional book. We did this during Revival Camp this summer and I loved being able to use elements of each kit in the other ones. 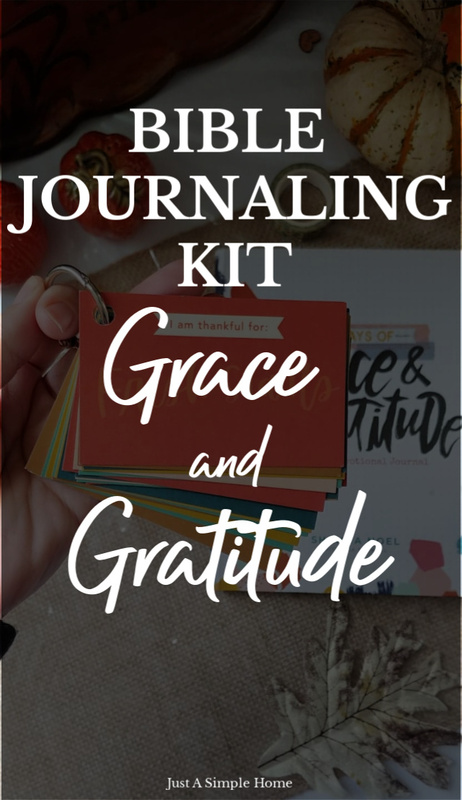 The October Bible Journaling Devotional Kit is called Grace and Gratitude and is aptly named. While I try to focus on being grateful each and every day, realistically it might not happen. I love that I will now be prompted to focus on being thankful and grateful each day of the month with these beautiful prompts. You may notice that there isn’t a typical devotional in the kit this month. Instead, we get 30 of these cute color coordinating Scripture cards with something to be grateful for on the front and a Scripture reference on the back. 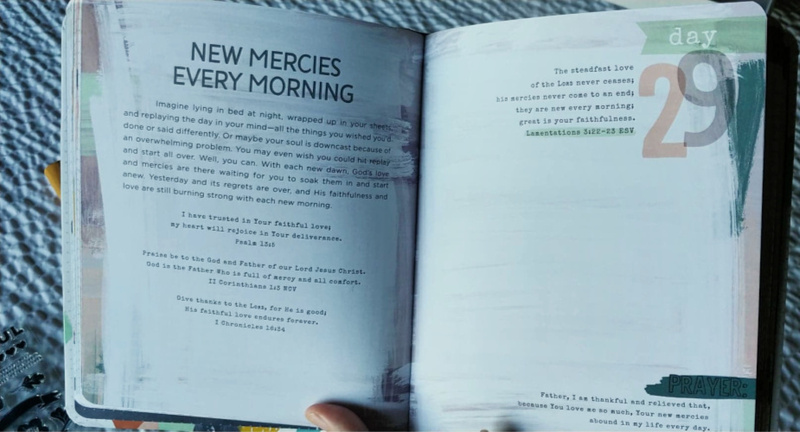 The card stock stickers also contain the same prompts that are on the Scripture cards. I love the script they used and that the stickers are in black. Sometimes I like using colored fonts, but for the most part I prefer using colored elements on my page and then sticking with black writing. Just a personal preference! As always, we get a 4×6 sized stamp set to coordinate with the kit. I don’t know about you, but I love also using these stamps in my planners- both my daily planner and my faith planner! I love that many of the stamps this month are stamps we can use over and over throughout the year. 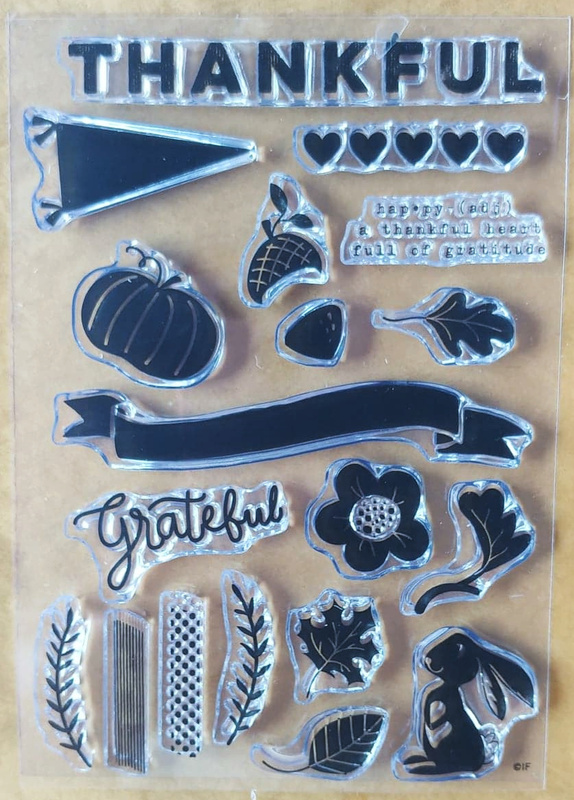 There are some that will go better with the Gratitude themed journaling, of course, but for the most part they are elements we can use over and over again. Shauna also included a fun little surprise in the kits this month! Check out this Acorn-Fetti she created with Elaine Davis! I can’t wait to see the fun things everyone uses this for! We can’t forget about the washi tape, of course! 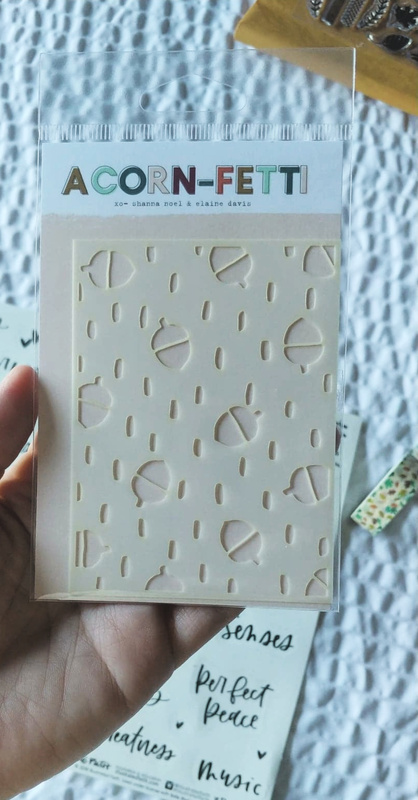 Did you see how cute the washi tape is this month! I love the little acorns! Illustrated Faith has always been so generous with the washi tape. I never use an entire roll while journaling through a kit, which means I have plenty left over to use as I wish for many months to come. I don’t have to be stingy about it when my daughters ask to use it, either! There are also these adorable leaf die cut pieces included in your kit. As soon as I saw these, I wished I had more! I plan on not only using these pieces in my Journaling Bible, but in my planner. So cute! There is also a free download that will be emailed to you when you purchase your kit. This is one of my favorite new features they added! You will get a few pages of printables with elements from the kit and cute little journaling cards and more. Be on the lookout in your email for it! You can grab your October Grace and Gratitude kit today and start journaling along with us! I can’t wait to see how you are inspired by God through this kit! 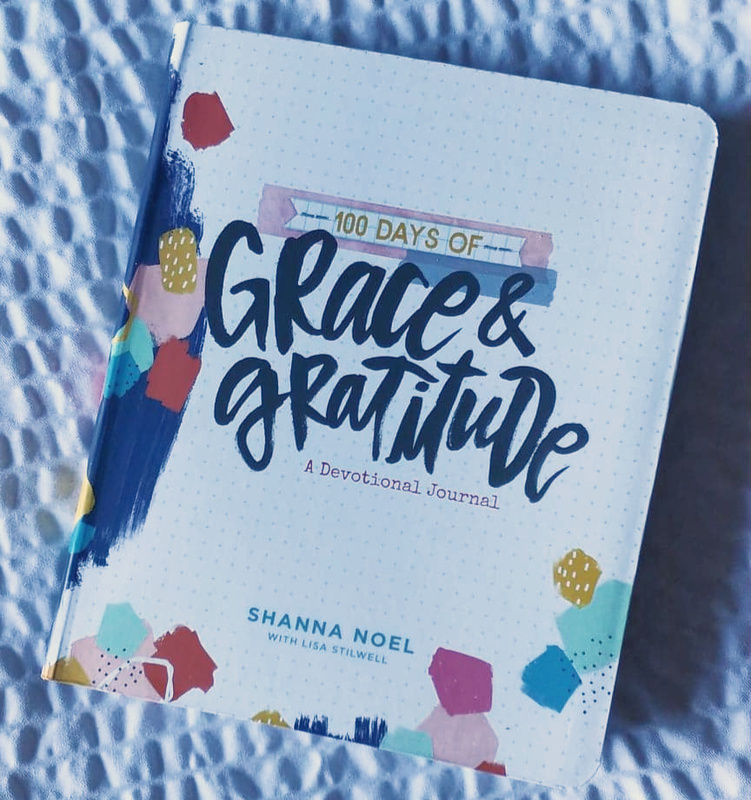 This year, instead of the email prompts we had in previous years, Illustrated Faith came out with a brand new Devotional Journal, called the 100 Days of Grace And Gratitude Devotional Journal. This book will replace the Gratitude Documented prompts we had in the past. Some of us completed the 100 Days Of Promises devo book this spring, so you may be familiar with this style of journaling. I am actually really excited about doing this with the whole community. The Scripture cards in the Dveotional Kit go along with the 100 Days of Grace and Gratitude book. We start the 100 Days challenge on November 1st, and you can jump in anytime! Don’t feel pressured to complete ALL 100 days- journal when you can and when you feel inspired. If you want to journal each and every day, great! But there is no pressure. Remember the entire point of all of this- deepening your relationship with the Lord and learning more about Him. You can grab your Bible Journaling Kit for this month here and join along with us! If you want to start the 100 Days of Grace and Gratitude challenge with us, make sure to get your 100 Days Devo book at the same time! We have a new community for moms who want to learn more about journaling! You do not have to be creative to join- the important thing is to dig into God’s Word together. You can be an avid Bible Journaler, someone who prefers note taking, someone who uses a 10 cent spiral notebook to journal, and anything in between! Feel free to share with others who would love a community like this. JOIN HERE. Ok so this looks very great!! Pay day is next week for me and I want the 100 days book!! Being focused on gratitude is the best way to close out 2018!! I couldn’t agree more! We start together on the 1st, so you should get your book in time! This is such a great kit!! Especially for homeschooling moms who, like you said, may not feel grateful in the moments of chaos, but it’s about taking action. I’ll have to bookmark this for later! I’ve never seen this, but it looks cute and fun! I’ve always wanted to try Bible journaling, but it can be so intimidating!! I had no idea that Dayspring offered this! Definitely checking it out! My devotional life needs a little kick in the pants.